Concept: Become a part of the billion dollar wedding industry with AVeryLovelyWedding.com! This lovely designed online wedding boutique for sale by Pure-Ecommerce is a part of our choose your own products internet business collection, which means YOU get to pick the products you would like to sell online. You have the opportunity to choose drop ship products to fill the easy-to-shop categories including wedding favors, ceremony essentials, reception accessories, beautiful wedding invitations, wedding gifts and more! The happy couple will find it simple to find everything on their list with this online store's easy to navigate categories, as well as, eye-catching home banners to help them find "Stunning Favors & More", plus everything they need for "The Perfect Shower", "A Beautiful Reception" and "A Memorable Ceremony". 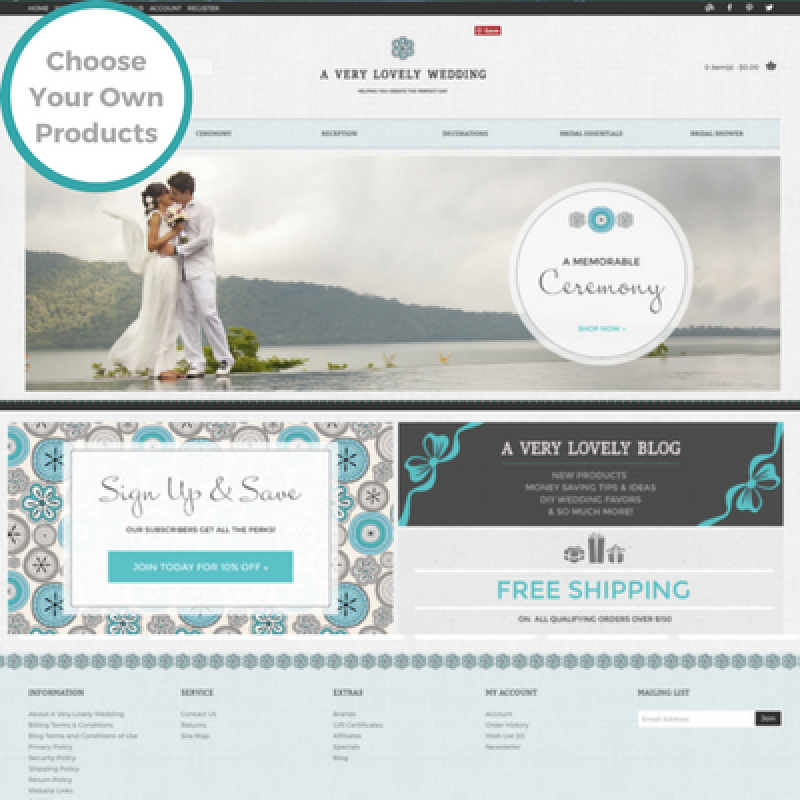 This online store offers everything the bride and groom need to create "a very lovely wedding"! Our team can help you step into this exciting online business opportunity you can work from anywhere! We will load this site with the first 800 drop ship products of your choosing. By working with drop ship vendors this allows you the flexibility to run your online store from any location with a schedule that works for you. You will also receive access to our exclusive eLearning Library as you work through our 10 Step Instructional Process as you learn to set up, run and market your website business. Looking for more assistance in getting your online business off the ground - then check out our platinum package upgrade option! The wedding industry has grown to an empire of 40 billion dollars per year. 78% of Couples use the internet to search to find products & services for their wedding. Wedding or bridal websites are the second most used source at 76% followed by wedding or bridal magazines (61%) and friend or family recommendation (61%). There are approximately 2.5 million weddings in the United States each year.